73 Democratic, 2 Republican State Legislative Candidates Back "Iowa Model"
Since CC/WI announced on August 30th that we would be posting the names of all "pro-active" November 2018 election state legislative and statewide candidates who support non-partisan redistricting reform, and specifically, the "Iowa Plan," we have heard from, or know of, 75 state legislative and two statewide candidates (Tony Evers and Doug La Follette) who do so. A total of 75 Democratic candidates and two Republican candidates support this critical and needed reform measure. We have not heard from any third party candidates to date. Here is the updated list of supporters, as of this morning, October 2nd. 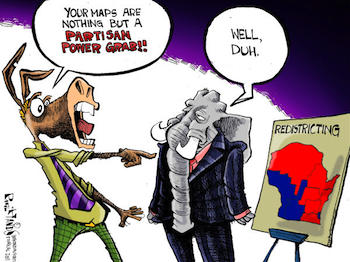 There may be candidates for state office who support redistricting reform but are not yet on our radar screen. Any statewide or state legislative candidate (or their authorized proxy) who supports the "Iowa Plan" and would like to see their name listed on our site should contact CC/WI by phone at (608) 256-2686 (leave a message if no answer), by email or by letter: CC/WI, P.O. Box 2597, Madison, WI 53701-2597. Citizens can urge candidates to support non-partisan redistricting reform and request that they get their names on this list. Candidates must be pro-active to have their names appear on this site. That shows us and the voters of Wisconsin that you are "paying attention" to this issue. So no complaints that CC/WI "should have known" of your support for this reform, please! We will update the list constantly and have published a link to it in the sidebar of our website for anyone to check to see who is on it and therefore in support of the Iowa Plan. 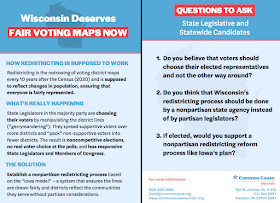 There is more that you can do to advance non-partisan redistricting reform in Wisconsin in the next six weeks before the November 6th election. First, you can download and print the postcard sized information sheet with questions to ask state legislative and statewide candidates at candidate forums and to distribute to your friends and family to do the same. Challenging candidates in person or through the media to support redistricting reform is very powerful and effective. Second, if you haven't done so yet, please "sign" the online petition in support of the "Iowa Plan" for Wisconsin and urge friends and family to do so as well. We already have just over 4,000 "signatures" and would love to have well over 5,000 to present to the new Wisconsin Legislature, after the election, in early 2019. Let's make ending partisan gerrymandering a central focus during this election season and finally achieve the redistricting process Wisconsin voters of all political persuasions want and deserve. 75 State Legislative Candidates; Evers & La Follette Signal Support for Ending Partisan GerrymanderingTweet this!